มีแพ็คยาสำหรับฉีดเข้าเส้นเลือดด้วยโดยมียาขวดหนึ่งและหลอดสารละลายอีกหลอดหนึ่ง ในขวดจะมียาเป็นผงออกสีขาว ๆ ซึ่งมี omeprazole sodium 42.6 มก. ซึ่งเท่ากับโอมีปราโซล 40 มก. ↑ 1.0 1.1 1.2 1.3 1.4 1.5 1.6 1.7 1.8 1.9 "Omeprazole". The American Society of Health-System Pharmacists. Archived from the original on 2015-09-24. สืบค้นเมื่อ 2015-12-01. ↑ "Prilosec Prescribing Information" (PDF). AstraZeneca Pharmaceuticals. Archived from the original (PDF) on 2010-02-16. ↑ Vaz-Da-Silva, M; Loureiro, AI; Nunes, T; Maia, J; Tavares, S; Falcão, A; Silveira, P; Almeida, L; Soares-Da-Silva, P (2005). "Bioavailability and bioequivalence of two enteric-coated formulations of omeprazole in fasting and fed conditions". Clinical Drug Investigation. 25 (6): 391–9. doi:10.2165/00044011-200525060-00004. PMID 17532679. Archived from the original on 2013-03-13. ↑ "Omeprazole 40 mg Powder for Solution for Infusion". EMC. 2016-02-10. Archived from the original on 2016-04-07. สืบค้นเมื่อ 2016-03-29. ↑ "Omeprazole". International Drug Price Indicator Guide. Archived from the original on 2017-05-10. สืบค้นเมื่อ 2015-12-01. ↑ "NADAC as of 2016-11-16 Data.Medicaid.gov". Centers for Medicare and Medicaid Services. Archived from the original on 2016-11-17. ↑ Fuccio, L; Minardi, M. E.; Zagari, R. M.; Grilli, D; Magrini, N; Bazzoli, F (2007). "Meta-analysis: Duration of first-line proton-pump inhibitor based triple therapy for Helicobacter pylori eradication". Annals of Internal Medicine. 147 (8): 553–62. doi:10.7326/0003-4819-147-8-200710160-00008. PMID 17938394. ↑ Yang, Yu-Xiao; และคณะ (2006). "Long-term proton pump inhibitor therapy and risk of hip fracture". JAMA. 296 (24): 2947–2953. doi:10.1001/jama.296.24.2947. PMID 17190895. ↑ Yu, Elaine W.; และคณะ (2011). "Proton pump inhibitors and risk of fractures: a meta-analysis of 11 international studies". The American Journal of Medicine. 124 (6): 519–526. doi:10.1016/j.amjmed.2011.01.007. PMC 3101476. PMID 21605729. ↑ Hess, M. W.; และคณะ (2012). "Systematic review: hypomagnesaemia induced by proton pump inhibition". Alimentary pharmacology & therapeutics. 36 (5): 405–413. doi:10.1111/j.1365-2036.2012.05201.x. ↑ Neal, Keith; Logan, Richard (2001). "Potential gastrointestinal effects of long‐term acid suppression with proton pump inhibitors". Alimentary pharmacology & therapeutics. 15 (7): 1085–1085. doi:10.1046/j.1365-2036.2001.0994a.x. PMID 11421886. ↑ Sarzynski, Erin; และคณะ (2011). "Association between proton pump inhibitor use and anemia: a retrospective cohort study". Digestive diseases and sciences. 56 (8): 2349–2353. doi:10.1007/s10620-011-1589-y. PMID 21318590. ↑ McColl, Kenneth EL (2009). "Effect of proton pump inhibitors on vitamins and iron". The American Journal of Gastroenterology. 104: S5–S9. doi:10.1038/ajg.2009.45. PMID 19262546. ↑ Härmark, Linda; และคณะ (2007). "Proton pump inhibitor‐induced acute interstitial nephritis". British Journal of Clinical Pharmacology. 64 (6): 819–823. doi:10.1111/j.1365-2125.2007.02927.x. PMC 2198775. PMID 17635502. ↑ Pasternak, Björn; Hviid, Anders (2010). "Use of Proton-Pump Inhibitors in Early Pregnancy and the Risk of Birth Defects". New England Journal of Medicine. 363 (22): 2114–23. doi:10.1056/NEJMoa1002689. PMID 21105793. ↑ "Omeprazole drug summary". PDR.net. Archived from the original on 2014-03-03. สืบค้นเมื่อ 2014-03-03. 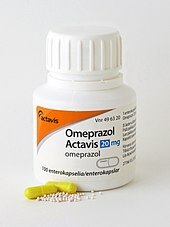 ↑ "LACTMED: OMEPRAZOLE". 2015-03-10. Archived from the original on 2017-09-08. สืบค้นเมื่อ 2015-12-01. ↑ Douglas, I. J.; Evans, S. J.; Hingorani, A. D.; Grosso, A. M.; Timmis, A; Hemingway, H; Smeeth, L (2012). "Clopidogrel and interaction with proton pump inhibitors: comparison between cohort and within person study designs". BMJ. 345: e4388. doi:10.1136/bmj.e4388. PMC 3392956. PMID 22782731. ↑ Focks, J. J.; Brouwer, M. A.; Van Oijen, M. G. H.; Lanas, A.; Bhatt, D. L.; Verheugt, F. W. A. (2012). "Concomitant use of clopidogrel and proton pump inhibitors: Impact on platelet function and clinical outcome- a systematic review". Heart. 99 (8): 520–7. doi:10.1136/heartjnl-2012-302371. PMID 22851683. ↑ Torkamani, Ali. "Selective Serotonin Reuptake Inhibitors and CYP2D6". Medscape.com. Archived from the original on 2015-05-09. ↑ Izzo, AA; Ernst, E (2009). "Interactions between herbal medicines and prescribed drugs: an updated systematic review". Drugs. 69 (13): 1777–1798. doi:10.2165/11317010-000000000-00000. PMID 19719333. ↑ Brayfield, A, ed. (2014-01-06). "Methotrexate". Martindale: The Complete Drug Reference. Pharmaceutical Press. สืบค้นเมื่อ 2014-04-12. ↑ "DrugBank: Omeprazole (DB00338)". Drugbank.ca. Archived from the original on 2014-02-05. สืบค้นเมื่อ 2014-02-24. ↑ "Omeprazole [package insert]". India: Dr. Reddy's Laboratories Limited. Archived from the original on 2014-04-19. Revised: 0613. ↑ Katz, PO; Gerson, LB; Vela, MF (2013). "Guidelines for the diagnosis and management of gastroesophageal reflux disease". Am J Gastroenterol. 108 (3): 308–28. doi:10.1038/ajg.2012.444. PMID 23419381. ↑ 43.0 43.1 "Zegerid (Omeprazole, Sodium Bicarbonate) Patient Information, Side Effects". RxList. 2013-02-14. สืบค้นเมื่อ 2018-07-26. 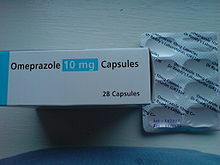 ↑ "Omeprazole, in The Free Medical Dictionary". สืบค้นเมื่อ 2010-11-11. ↑ "Omeprazole". Drugs.com. Archived from the original on 2011-02-19. สืบค้นเมื่อ 2010-11-11. ↑ "Omeprazole". MIMS Malaysia. สืบค้นเมื่อ 2018-07-30. Cap: Should be taken with food. Take immediately before a meal. Mups Tab: May be taken with or without food. ↑ Harris, Gardiner (2002-06-06). "Prilosec's Maker Switches Users To Nexium, Thwarting Generics". The Wall Street Journal. Archived from the original on 2017-08-06. ↑ "Santarus Receives FDA Approval for Immediate-Release Omeprazole Tablet with Dual Buffers". Santarus (Press release). 2009-12-04. Archived from the original on 2014-04-18. หน้านี้แก้ไขล่าสุดเมื่อวันที่ 10 สิงหาคม 2561 เวลา 16:18 น.